This stage has the distinction of being the shortest and easiest one in the game. It is, in essence, the calm before the storm. 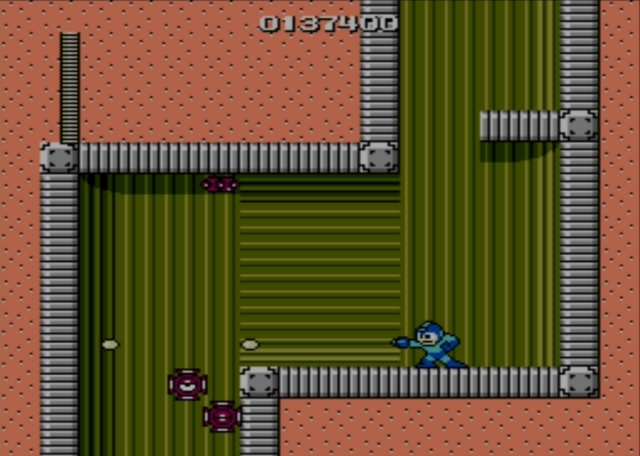 Start down the metallic corridor, blasting the red sponge-covered enemies as you go. You will drop through a few rooms, each occupied by more of those same foes. There are also the sprinkler-like robots in some cases. You shouldn't take much damage, though, even if you mess up and let something hit you. When you reach the base of that series of corridors, then it's time to head toward the right. As you go, a wave washes over you and the corridor fills with water. Just keep pushing toward the right, mashing the button to fire standard arm cannon shots. They'll take out any birds or fish that come swimming your way, allowing you to collect any goodies that may drop. Then you'll reach the closed area at the end and it's time for a boss battle. 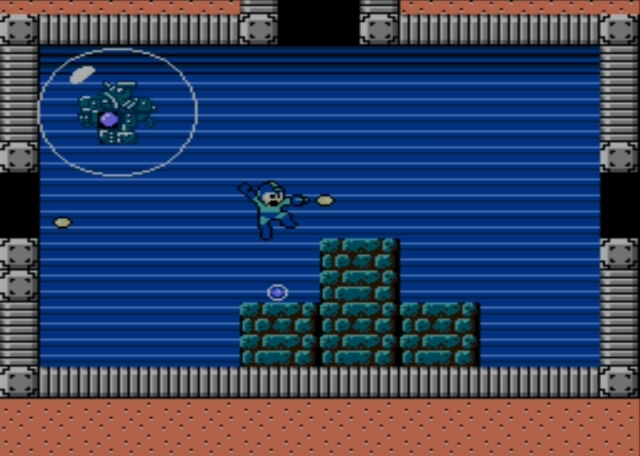 Here is a boss encounter that doesn't require you to get cheesy in order to win, which is a nice change from the norm in Wily's wretched castle. As you arrive in the boss chamber, look quickly around. There are openings along several sides of the room, and a pile of huge blocks at the room's center. You want to head out and hop onto the those blocks, as you'll be using them to your advantage. A robot encased in a giant bubble will emerge from one of the holes and make its way around the chamber's perimeter. It is large enough that you have to work quickly to avoid colliding, and you want to hit it with shots from your arm cannon as you evade. When you destroy it, another will appear from another opening to keep up the fight, and then after that another one. The final few robots that appear move much more quickly, and now you should switch to your Guts ability and toss blocks to eliminate them more efficiently. You should just barely have time to scramble and grab another block between each new appearance. Toss them at their targets (which now must not be happy they're so large), and soon you should win the fight with ease. None of the material contained within this site may be reproduced in any conceivable fashion without permission from the author(s) of said material. This site is not sponsored or endorsed by Nintendo, Sega, Sony, Microsoft, or any other such party. 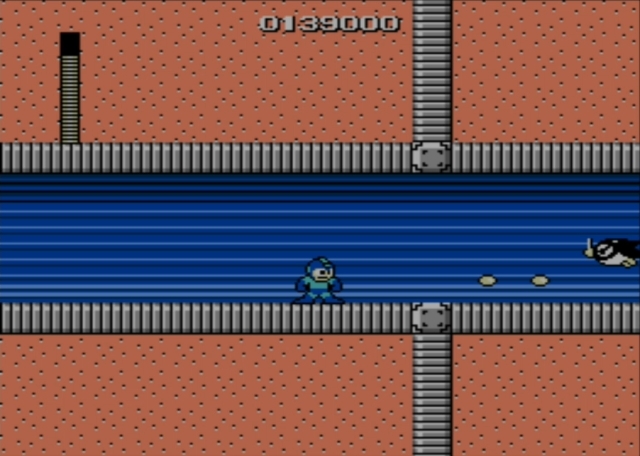 Mega Man is the property of its copyright holder(s).